The Annual Report presents the entire range of BIRN’s activities across the region from the perspectives of visibility, reach and impact. In 2016, members of the BIRN network operated in a challenging environment which was marked by authoritarian tendencies among political elites, political turmoil, economic difficulties and deteriorating media freedoms. Political and financial pressure on the media, the refugee crisis, the long-term economic crisis and accompanying high unemployment, and high levels of corruption are just some problems that countries in the region have experienced. 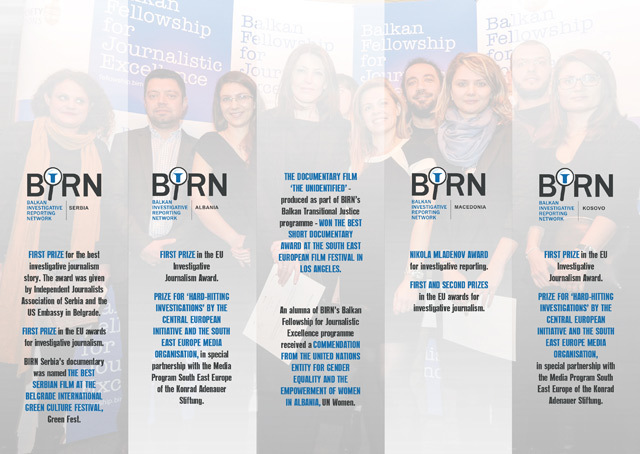 Through investigative, analytical and specialised coverage of underreported topics such as war crimes cases, the flow of public money, cases of potential or verified corruption, problems within justice systems, media freedoms and ethics, and security issues etc., BIRN continued to play an important role in providing people in the Balkans with access to accurate information. In this way, we show the scope and significance of the Network’s endeavours: for audiences in the countries of the region and beyond, media professionals, academics, policy makers (in the region and in international organisations), for the civil society sector, and for vulnerable groups. BIRN journalists and film-makers have also received awards for their work in their respective countries and internationally, and the report provides information about this.